ABC wasn’t far behind Nine last night, with less than 4% separating second and third places. That was due to Australian Story and 7:30 scoring ahead of The Block and more disappointing numbers for Gallipoli, now down to 479,000 / 373,000 for two episodes. Meanwhile Q & A attracted plenty of media today due to lively political comments by panelist Miriam Margoyles. It rated 611,000 / 109,000 over two channels, but from next week is confined to a single channel and a live iview broadcast. But it was again Seven Network that was streets ahead with a 32.3% share then Nine 23.7%, ABC 20.3%, TEN 18.4% and SBS 5.1%. My Kitchen Rules was 1.65m viewers for Seven then Seven News (1.03m / 1.00m), Home and Away (855,000), Revenge (661,000) and Million Dollar Minute (444,000). Parenthood was 307,000 / 242,000. Nine News (1.11m / 1.05m) led Nine’s night followed by A Current Affair‘s biggest audience this year (989,000), The Block (723,000), Hot Seat (562,000) and Gallipoli (479,000 / 373,000). ABC News (908,000), Australian Story (836,000), 7:30 (815,000), Four Corners (809,000) all scored for ABC then Media Watch (723,000) and Q & A (611,000 / 109,000). TEN Eyewitness News was 602,000 on TEN. The Project was 591,000 / 453,000, Law and Order: SVU was 493,000. Elementary was 233,000. On SBS ONE it was Richard Hammond’s Wild Weather (265,000), Simon Reeve’s Sacred Rivers (228,000) and SBS World News (136,000). A repeat of Gourmet Farmer Afloat was 107,000. 7TWO’s Judge John Deed was 242,000 on multichannels. Nine is [email protected]! The only show on Nine I like is Millionaire Hot Seat. I am heartbroken Gallipoli is not attracting the audience it deserves. It is a minor masterpiece and will be seen by most Australian students as part of their history studies in due course and find a wider audience over time. At least it It will clean up at awards time rewarding these amazing filmmakers – cast and crew with the acknowledgment they deserve. Agree it will do well in Awards. Good to see the ABC doing better recently on Mondays. They deserve these higher ratings. Sad to see ACA get such good numbers, but that is rectified by the low ratings for The Block. Gallipoli is boring. Nothing we haven’t seen before. Seems Today is doing better now, not such a large gap between this and Sunrise. 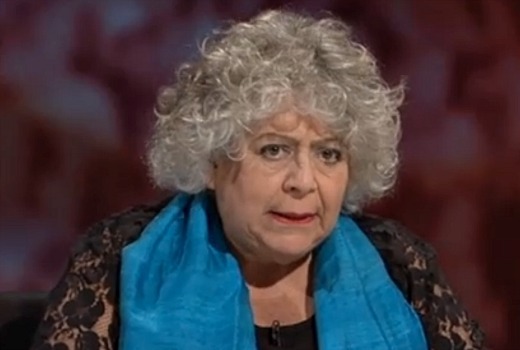 Miriam Margoyles was fantastic on Q&A. I wish she scored more screen time! Fantastic to see the ABC on Nine’s heels. More of it. I would like to see Miriam stick to acting, many of her political view points are appalling and she probably has no intention of standing for election, so I prefer less (panel based) screen time for her. yes, i agree with you jezza – i like her acting, but she is overly theatrical and her points are made so stridently; and at times a little recklessly. Many of her view points were also dead on, hence the spirited applause they attracted. And since when was Q&A only for those with political aspirations? Entertainers on the panel often make the best points because they don’t tapdance around the questions like too many others do. Comments like that are exactly why actors and media personalities are an integral part of this program. Good night of tv for me – watched Neighbours, I’m A Celeb, MKR, Q&A, Four Corners and Media Watch. Can’t stand The Block. Well done to I’m a celebrity beating the block again. Just sad it’s now without Andrew Daddo. Still can’t believe he’s gone. Basically every comment I’ve seen regarding his departure is how people didn’t want him to leave, and yet he did? Probably people just thought he’d be safe, but still they could have backed that thought up by voting for him because as long as you vote correctly on Facebook or Twitter it is free, only sms voting charges you. Would have probably been much better off with Barry leaving. He just seems to coming across as a big no fun grump. Agree about Andrew – he is an absolute sweetheart and definitely the heart and soul of the group. Haven’t heard a bad word said about him, either from the other contestants or on Facebook by the viewing public. Was a real shock to everyone that he left – really thought he would win. The problem with Andrew is just that he was pretty boring to watch. So nobody voted to keep him in. Whereas people will vote for Barry as he adds some drama to the show. Its a shame that the greyhounds and apples of this world makes news the next day after a 4 corners story but the important issue of the disgrace that are employment agencies don’t. Have been watching more ABC on Monday nights than normally would. Haven’t watched last nights Q&A as yet. It doesn’t seem there is much on offer on commercial networks on Monday nights and parenthood is just on way too late.